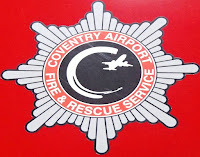 On Wednesday 29th July, the 84 Squadron cadets enjoyed a fantastic visit to the Airport Fire Section where they experienced getting ready for a call out, rolling out water hoses and then watched a demonstration of an aircraft fire being extinguished. Fire Officer Wayne Perry gave an insight into the role of the airfield firefighter, the tasks they undertake on a day-to-day shift as well as the emergency protocolls. Cadets were tasked with getting one team member into the full 'rig' including boots, under layers, over layers and helmet....all whilst they wore gloves! Cadets were amazed to learn that the crew had to do all this and be at the scene of the emergency within 2 minutes of the alarm sounding! Following the talk and a question-answer session they then went out to get wet! Cadets were shown how to roll out the hoses, connect them and then aim at a specific target. They each had a go with the forceful hose which for some was a little too strong to handle on their own! To end the evening, the crew put on a demonstration of how they would tackle an engine fire on an aircraft with their simulator. Even from the our position standing back on the bank, the warmth could be felt and the team just went in with their protective gear and equipment to deal with the blaze in a matter of minutes. A huge thanks to the crew at the Airport Fire Section, we hope to be back again soon for some more! Check out the Squadron Facebook page for more photos.